The history of billiards is long and very rich. The game has been played by kings and commoners, presidents, mental patients, ladies, gentlemen, and hustlers alike. It evolved from a lawn game similar to the croquet played sometime during the 15th century in Northern Europe and probably in France. Play was moved indoors to a wooden table with green cloth to simulate grass, and a simple border was placed around the edges. The balls were shoved, rather than struck, with wooden sticks called “maces”. The term “billiard” is derived from French, either from the word “billart”, one of the wooden sticks, or “bille”, a ball. 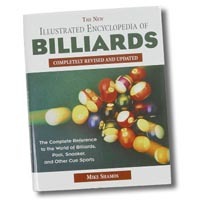 Mike Shamos is the author of The Illustrated Encyclopedia of Billiards and curator of The Billiard Archive, a nonprofit organization established to preserve the game‘s history. The cue stick was developed in the late 1600’s. When the ball lay near a rail, the mace was very inconvenient to use because of its large head. In such a case, the players would turn the mace around and use its handle to strike the ball. The handle was called a “queue”- meaning “tail”- from which we get the word “cue”. For a long time, only men were allowed to use the cue; women were forced to use the mace because it was felt they were more likely to rip the cloth with the sharper cue. Billiard equipment improved rapidly in England after 1800, largely because of the Industrial Revolution. Chalk was used to increase friction between the ball and the cue stick even before cues had tips. The leather cue tip, with which a player can apply side-spin to the ball, was perfected by 1823. Visitors from England showed Americans how to use spin, which explains why it is called “English” in the United States but nowhere else. (The British themselves refer to it as “side”). The two-piece cue arrived in 1829. Slate became popular as a material for table beds around 1835. Goodyear discovered vulcanization of rubber in 1839 and by 1845 it was used to make billiard cushions. By 1850, the billiard table had essentially evolved into its current form. The dominant billiard game in Britain from about 1770 until the 1920’s was English Billiards, played with three balls and six pockets on a large rectangular table. A two-to-one ratio of length to width became standard in the 18th century. Before then, there were no fixed table dimensions. The British billiard tradition is carried on today primarily through the game of Snooker, a complex and colorful game combining offensive and defensive aspects and played on the same equipment as English Billiards but with 22 balls instead of three. The British appetite for Snooker is approached only by the American passion for baseball; it is possible to see a Snooker competition every day in Britain. How billiards came to America has not been positively established. There are tales that it was brought to St. Augustine by the Spaniards in the 1580’s but research has failed to reveal any trace of the game there. More likely it was brought over by Dutch and English settlers. A number of American cabinetmakers in the 1700’s turned out exquisite billiard tables, although in small quantities. Nevertheless, the game did spread throughout the Colonies. Even George Washington was reported to have won a match in 1748. By 1830, despite primitive equipment, public rooms devoted entirely to billiards appeared. The most famous of them was Bassford’s, a New York room that catered to stockbrokers. Here a number of American versions of billiards were developed, including Pin Pool, played with small wooden targets like miniature bowling pins, and Fifteen-Ball Pool, described later. The American billiard industry and the incredible rise in popularity of the game are due to Michael Phelan, the father of American billiards. Phelan emigrated from Ireland and in 1850 wrote the first American book on the game. He was influential in devising rules and setting standards of behavior. An inventor, he added diamonds to the table to assist in aiming, and developed new table and cushion designs. He was also the first American billiard columnist. On January 1, 1859, the first of his weekly articles appeared in Leslie’s Illustrated Weekly. A few months later, Phelan won $15,000 in Detroit at the first important stake match held in the United States. He was a tireless promoter of the game and created the manufacturing company of Phelan and Collender. In 1884 the company merged with its chief competitor, J.M. Brunswick & Balke, to form the Brunswick-Balke-Collender Company, which tightly controlled all aspects of the game until the 1950’s. The dominant American billiard game until the 1870’s was American Four-Ball Billiards, usually played on a large (11 or 12-foot), four-pocket table with four balls - two white and two red. It was a direct extension of English Billiards. Points were scored by pocketing balls, scratching the cue ball, or by making caroms on two or three balls. A “carom” is the act of hitting two object balls with the cue ball in one stroke. With so many balls, there were many different ways of scoring and it was possible to make up to 13 points on a single shot. American Four-Ball produced two offspring, both of which surpassed it in popularity by the late 1870’s. One, simple caroms played with three balls on a pocketless table, is sometimes known as “Straight Rail”, the forerunner of all carom games. The other popular game was American Fifteen-Ball Pool, the predecessor of modern pocket billiards. The word “pool” means a collective bet, or ante. Many non-billiard games, such as poker, involve a pool but it was to pocket billiards that the name became attached. The term “poolroom” now means a place where pool is played, but in the 19th century a poolroom was a betting parlor for horse racing. Pool tables were installed so patrons could pass the time between races. The two became connected in the public mind, but the unsavory connotation of “poolroom” came from the betting that took place there, not from billiards. Fifteen-Ball Pool was played with 15 object balls, numbered 1 through 15. For sinking a ball, the player received a number of points equal to the value of the ball. The sum of the ball values in a rack is 120, so the first player who received more than half the total, or 61, was the winner. This game, also called “61-Pool”, was used in the first American championship pool tournament held in 1878 and won by Cyrille Dion, a Canadian. In 1888, it was thought more fair to count the number of balls pocketed by a player and not their numerical value. Thus, 14.1 Continuous Pool replaced Fifteen-Ball Pool as the championship game. The player who sank the last ball of a rack would break the next rack and his point total would be kept “continuously” from one rack to the next. From 1878 until 1956, pool and billiard championship tournaments were held almost annually, with one-on-one challenge matches filling the remaining months. At times, including during the Civil War, billiard results received wider coverage than war news. Players were so renowned that cigarette cards were issued featuring them. The BCA Hall of Fame honors many players from this era, including Jacob Schaefer, Sr. and his son, Jake Jr., Frank Taberski, Alfredo DeOro, and Johnny Layton. The first half of this century was the era of the billiard personality. In 1906, Willie Hoppe, at the age of 18, established the supremacy of American players by beating Maurice Vignaux of France at balkline. Balkline is a version of carom billiards with lines drawn on the table to form rectangles. When both object balls lie in the same rectangle, the number of shots that can be made is restricted. This makes the game much harder because the player must cause one of the balls to leave the rectangle, and hopefully return. When balkline lost its popularity during the 1930’s, Hoppe began a new career in three-cushion billiards which he dominated until he retired in 1952. Hoppe was a true American legend - a boy of humble roots whose talent was discovered early, a world champion as a teenager, and a gentleman who held professional titles for almost 50 years. One newspaper reported that under his manipulation, the balls moved “as if under a magic spell”, to many fans, billiards meant Hoppe. While the term “billiards” refers to all the games played on a billiard table, with or without pockets, some people take billiards to mean carom games only and use pool for pocket games. Carom games, particularly balkline, dominated public attention until 1919, when Ralph Greenleaf’s pool playing captured the nation’s attention. For the next 20 years he gave up the title on only a few occasions. Through the 1930’s, both pool and billiards, particularly three-cushion billiards, shared the spotlight. In 1941 the Mosconi era began and carom games declined in importance. Pool went to war several times as a popular recreation for the troops. Professional players toured military posts giving exhibitions; some even worked in the defense industry. But the game had more trouble emerging from World War II than it had getting into it. Returning soldiers were in a mood to buy houses and build careers, and the charm of an afternoon spent at the pool table was a thing of the past. Room after room closed quietly and by the end of the 1950’s it looked as though the game might pass into oblivion. Willie Mosconi, who won or successfully defended the pocket billiard title 19 times, retired as champion in 1956. Billiards was revived by two events, one in 1961, the other in 1986. The first was the release of the movie, “The Hustler”, based on the novel by Walter Tevis. The film depicted the dark life of a pool hustler with Paul Newman in the title role. New rooms opened all over the country and for the remainder of the 60’s pool flourished, until social concerns, the Vietnam War, and an increase in outdoor activities led to a decline in the game. In 1986, “The Color of Money”, the sequel to “The Hustler” with Paul Newman in the same role and Tom Cruise as an up-and-coming professional, brought the excitement of pool to a new generation. The opening of upscale rooms catered to a new type of player, whose senses may have been offended by the old cliché of poolrooms. While the game has had its heroes since the early 1800’s, it has waged a constant battle for respectability. In the 1920’s, the poolroom was an environment in which men gathered to loiter, fight, bet and play, so they were often the target of politicians eager to show their ability to purge immorality from the communities. Most rooms now bear no resemblance to those of earlier times. The atmosphere of many new rooms approaches that of chic restaurants and night clubs. They offer quality equipment, expert instruction, and the chance for people to meet socially for a friendly evening. These rooms have helped contribute to the greatest interest in billiards in over a century.